God’s Spirit (God’s Πνεῦμα) Was a Person? Did the Apostles Think That God’s Pneuma (Spirit) Was a Person? Did the New Testament authors refer to the Spirit of God as a thing (“it”) or as a person (“he”)? Careful attention to the words of the Greek New Testament can answer that important question. If those holy men referred to the Spirit as “he”,then it is certain that the authors of the New Testament books believed the Spirit to be a person, but if they referred to the Spirit as “it”, then they did not. So, the issue is simple, and the answer easy to determine; we need only to look at the original Greek text and see what is there. That is what I did. After I gathered the information on the words the original writers used when they referred to the Spirit of God, my focus became, How faithful to the original writers’ words are different versions of the Bible? So, I looked at English translations of the New Testament and compared what I found there with the original Greek. Amazingly, what I discovered in most versions of the Bible produced by Christians was irrefutable proof of intentional mistranslation of Greek words that referred to the Spirit of God. That statement is not an exaggeration, nor is it intended to antagonize anyone. It is simply a statement of fact, and it is a fact that no scholar on earth can refute. In the versions of the holy Scriptures I examined, I discovered that most Trinitarian Christians routinely and purposefully mistranslated the Greek for the obvious purpose of promoting their Trinitarian faith. (3) how those Greek words were translated in various versions of the Bible. Unlike biblical Hebrew, which is so simple and direct, biblical Greek is wonderfully precise, which is helpful in determining exactly what Greek writers were thinking when they wrote. In other words, we can determine what the authors of the New Testament meant much more easily than we can we can determine what Old Testament writers meant because the grammar and vocabulary of the Greek language enabled the writer to express himself more precisely. My hope is that this study will not seem complicated and that you will not be overwhelmed by grammatical details. If you do, the fault is mine because the facts themselves are simple. My aim was to present the information in such a way that the Reader does not have to be able to read Greek in order to see and understand the evidence. In biblical Greek, all nouns have gender; that is, they are either Masculine, Feminine, or Neuter. (“Neuter” means neither masculine nor feminine.) For example, in Greek, “Lord” is a masculine noun, “faith” is a feminine noun, and “spirit” is a neuter noun. Also, in biblical Greek, the spelling of the word, “the”, changed in order to “agree with” the gender of the noun. If the Greek writer wanted to say “the Lord”, he would write it like this: “ὁ” Lord because “Lord” is a masculine noun and “ὁ” is the masculine word for “the”. If the Greek writer wanted to say “the faith”, he would write it like this: “ἡ” faith because “faith” is a feminine word, and “ἡ” is the feminine word for “the”. If the Greek writer wanted to say “the Spirit”, he would write it like this: “τό” spirit because “spirit” is a neuter word, and “τό” is the neuter word for “the”. By “Agreement Rule”, we mean that if a noun is masculine (such as “Lord”), then its article, “the”, has to be masculine, too. And if a noun is feminine (such as “faith”), then its article, “the”, has to be feminine. And if a noun is neuter, (such as “Spirit”), then its article, “the”, has to be neuter. THE GENDER OF THE ARTICLE HAS TO AGREE WITH THE GENDER OF THE NOUN. Make sure you understand this idea before you continue. Look carefully at the middle two rows below. The masculine forms of “the” are spelled the same way the neuter forms are spelled. When writers of the New Testament used one of these identical forms, it made it impossible for us to determine whether they were thinking of a masculine “the” or a neuter “the”. The verses where those forms are found cannot help us determine whether or not the writers thought the Spirit is a person; therefore, they are left out of the main Pneuma Tables (Pneuma Table #2 and #3). 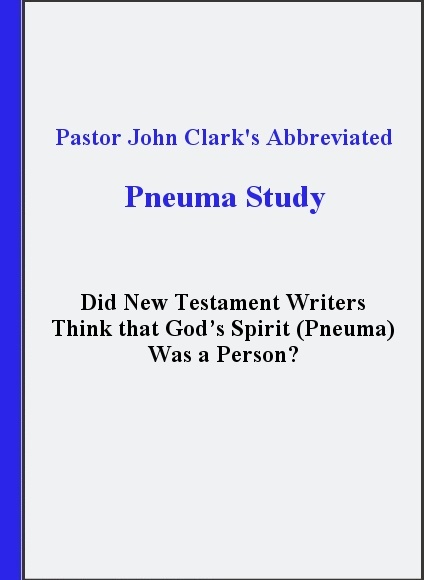 Pneuma Table #1 (found at the end of this study) contains all the New Testament verses in which writers referred to the Spirit with neuter forms of “the” (and other words) which are identical with masculine forms. As you can see, the forms of “the” in Pneuma Table #1 are useless in helping determine if the apostles thought the holy Spirit is a person, because all of those forms could be either masculine or neuter, as in the center two rows in the chart above. That is why those verses are not included in Pneuma Tables #2 and #3. After we remove all the unhelpful verses in Pneuma Table #1, we are left with verses that contain one of the four remaining forms of the article, “the”, shown in the chart below. You will notice that it is easy to tell the difference between these masculine and neuter forms of “the”. Because the biblical writers had a choice between masculine and neuter in these cases, these four forms can help us determine what the biblical writers had in mind when they wrote, “the Spirit”, whether they were thinking of the holy Spirit a person or a thing. Just as with the article, “the”, the spelling of Greek adjectives and pronouns changed in order to “agree with” the gender of the noun to which they referred. When Paul said, “one Lord”, he wrote, “εἵς Lord” because εἵς is the masculine Greek word for “one”. When Paul said, “one faith”, he wrote, “μία faith” because μία is the feminine word for “one”. When Paul said, “one baptism”, he wrote, “ἕν baptism” because ἕν is the neuter word for “one”. As for pronouns, their spelling also changed to “agree with” the gender of the noun. If the Greek writer wanted to say “he” or “himself”, he wrote, αὐτός. If the Greek writer wanted to say “she” or “herself”, he wrote, αὐτή. If the Greek writer wanted to say “it” or “itself”, he wrote, αὐτό. These changes in the spelling of articles, adjectives, and pronouns to match the gender of the noun being referred to was the rule. But the Greeks, with their penchant for being precise with their words, did not box themselves in. They allowed for exceptions to the Agreement Rule when doing so would clarify their meaning. And it is because of “The Exception to the Agreement Rule”, explained on the following page, that we know that the New Testament writers did not believe the Spirit of God is a person. Exceptions to this Agreement Rule were made whenever a neuter word referred to a person. Greek writers were allowed to change any neuter article, adjective, or pronoun to a masculine or feminine gender if the writer wanted to indicate that he was referring to a person. Dr. A. T. Robertson, in his classic, A Grammar of the Greek New Testament in the Light of Historical Research, points out that “personal pronouns are sometimes used freely according to the sense” (p. 683), adding later that changes in relative pronouns, too, can be “made according to the real gender rather than the grammatical” gender (p. 713).
. . . how will the one who occupies the place of the ignorant say the “Amen” at your giving of thanks? These things says the Amen, the faithful and true witness. Τάδα λέγει ὁ Ἀμην, ὁ μάρτυς ὁ πιστὸς καὶ ἀληθινός. THE EXCEPTION TO THE AGREEMENT RULE IS THE CRUX OF THIS STUDY.
. . . all the Gentiles, baptizing them . . .
. . . all the nations, upon whom my name is called . . .
And taking hold of the hand of the child, saying to her . . . I beg you for the child of mine, whom I have begotten in my bonds, Onesimus. Παρακαλῶ σε περὶ τοῦ ἐμοῦ τέκνου, ὅν ἐγέννησα ἐν τοίς δεσμοῖς, Ὀνήσιμον.
. . . not holding the head, from whom the whole body. . .
. . . wait for the promise of the Father, which you have heard of me . . . It is obvious from this that Luke did not consider the Spirit a divine person; otherwise, he would have used a masculine relative pronoun (“who”) to refer to the feminine word “promise”, as Paul used a masculine “who” in reference to the feminine word “head” when speaking of Jesus. Other feminine nouns that were used in reference to the Spirit are gift, sword, and dove, and they are all treated the same way “promise” is treated. As the Pneuma Tables show that the New Testament writers never changed genders from neuter to masculine when referring to the Spirit, the example from Acts 1:4, above, shows that the same can be said about feminine words. The New Testament writers never changed genders from feminine to masculine when using a feminine word for the Spirit, though they did change from feminine to masculine when using a feminine word (“head”) for Jesus! If the writers had thought that the Spirit was a person, they would certainly have shown that “person” the same respect they showed the person of Jesus. He who plants and he who waters are one. Ὁ φυτύων δὲ καὶ ὁ ποτίζων ἕν είσιν. Ἐγω καὶ ὁ πατὴρ ἕν ἐσμεν. 21. that they all might be one (ἕν), just as you, Father, are in me, and I in you, that they may also be one (ἕν) in us, so that the world might believe that you sent me. 23. I in them, and you in me, that they may be perfected in one (ἕν), and so that the world may know that you sent me, and that you loved them just as you loved me. You are now ready to go to the main Pneuma Tables. Remember, the Greek word for “spirit” (πνεῦμα) is neuter, just like “nations”, “slave” and “child”. The Pneuma Tables contain every verse in the New Testament in which the writers had a choice between a distinctive masculine or neuter article, adjective, or pronoun that referred to God’s Spirit. THE TABLES SHOW THAT EVERY TIME A NEW TESTAMENT WRITER HAD A CHOICE, HE CHOSE A NEUTER ARTICLE, ADJECTIVE, OR PRONOUN TO REFER TO THE SPIRIT. If the men of God who wrote the New Testament believed the Spirit to be a person, would they not have shown the Spirit of God the same respect they showed to Gentiles, slaves, and children? Trinitarians who believe that the Spirit of God is a person make much of John’s use of the masculine word, “Comforter”, in reference to the Spirit. But to my knowledge, none of them have ever made much of the apostles’ use of the feminine words that refer to the Spirit, such as dove, promise, sword, and gift. In fact, feminine nouns are used much more frequently than masculine nouns when the subject is the Spirit. The following verses from John appear to contain references to the Spirit (πνεῦμα) as “he”, “him”, and “whom”. Actually, those personal pronouns do not refer to the neuter word “Spirit”, but to the masculine word “Comforter” (παρακλήτος). And since “Comforter” is masculine, not neuter, masculine personal pronouns such as “he” or “whom” are used when referring to it. Using the charts already provided, look at the Greek words in bold, below, and determine which words John used to refer to the Spirit. Note: The last two words in bold must be translated on the basis of what has come before. They could mean either “it” or “he”. How would a translator decide which is correct? 17. the Spirit of truth ὃ [whom or which?] the world cannot receive because it neither sees αυτό [him or it?] nor knows αυτό [him or it?] But you know αυτό [him or it? ], because [he or it?] abides with you and [he or it?] will be in you. In the following scripture, John switches from “whom” to “which” in mid-sentence. Can you see why? Note: Near the end of the verse, you will see a new word, a demonstrative pronoun, meaning “that one”. Why did I translate it as “he”? When the Comforter comes, whom I will send to you from the Father, even the Spirit of truth which proceeds from the Father, he will testify of me. Ὁταν δὲ ἕλθῃ ὁ παρακλήτον ὅν ἐγὼ πέμψω ὑμῖν παρὰ τοῦ πατρός, τὸ πηεῦμα τῇς ἀληθείας ὃ παρὰ τοῦ πατρός ἐκπορεύεται, ἐκεῖνος μαρτυρήσει περὶ ἐμοῦ. John 16:7-14 appears to contain a masculine pronoun referring to the Spirit, but the neuter word, πνεῦμα, is not the subject of this section of John. Instead, the subject is the masculine word, Comforter (paraclatos). 7. Nevertheless, I tell you the truth; it is better for you that I go away. For if I do not go away, the Comforter will not come to you; but if I go, I will send him to you. 12. I still have much to tell you, but you are not now able to bear it. 13. But when he (lit., “that masculine one”) comes, the Spirit of truth, he will guide you into all truth; for he will not speak of himself, but whatever he will hear, he will speak, and he will reveal to you things that are coming. 14. He will glorify me because he will take from what is mine and reveal it to you. The powerful influence of the Trinitarian faith upon even a great scholar’s mind is evident in Professor A. T. Robertson’s treatment of the above passage from John 16, in particular, verse 13. He dismisses the possibility of “that (masculine) one” in verse 13 referring to Comforter because of the five verses that come between the word “Comforter” and that relative pronoun. And he makes that assertion, despite the fact that (1) verses 8-11 make up one long sentence and (2) “that (masculine) one” obviously refers to “Comforter” in verse 8, and is the subject of the entire whole sentence. Why then, would “that (masculine) one” (= Comforter) not be the subject of verse 13? To say, as Dr. Robertson does (p. 709), “in this passage John is insisting on the personality of the Holy Spirit” is, frankly, bizarre. It is clearly an unwarranted assessment of the grammar and imposes upon John a Trinitarian faith about which he in no other place says or suggests anything, though opportunities abounded for him to do so. It is surprising that the usually level-headed Dr. Robertson should have made such a statement. But that he does so is an indication of how one’s personal faith can distort one’s judgment. Dr. Robertson seems to agree with what he refers to as “Middleton’s Rule”, which holds that whenever the Greek article the is used with the Spirit (τὸ πνεῦμα) “personality is being taught” (p. 795). But in the New Testament, there are over ninety times when πνεῦμα is used without the article, as opposed to almost one-hundred-fifty times with it. So, are we to infer from those numbers that about 40% of the time (when the article is absent), the New Testament writers were teaching that the Spirit is not a person? From the Bible, we learn that a man’s spirit can be troubled (Gen. 41:8), revived (Gen. 45:27; Isa. 57:15), stirred up (1Chron. 5:26; 2Chron. 36:22; Ezra 1:1), wounded (Prov. 18: 14), overwhelmed (Ps. 77:3), and refreshed (1Cor. 16:18). Further, the spirit of man is said to be able either to make one willing to do something (Ex. 35:21), or to restrain one from an action (Job 32:18). Man’s spirit searches things out (Ps. 77:6; Prov. 20:27; Isa. 26:9; Ezek. 13:3; Mt. 22:43), sometimes fails (Ps. 143:7), and at other times sustains a man (Prov. 18:14). Man’s spirit can rejoice (Lk. 1:47), serve God (Rom. 1:9), and bear witness (Rom. 8:16). The spirit of man knows things (1Cor. 2:10-11). It can pray (1Cor. 14:14), and it sometimes needs rest (2Cor. 2:13). The spirit of man is said to travel (Eccl. 3:21; 12:7; Lk. 8:55; cp. 1Cor. 5:3-4), and amazingly, we are told it can go places and return (Jud. 15:19)! Why, man’s spirit can even stand up, and do work (Eccl. 10:4; Eph. 2:2)! When a man’s spirit needs rest, it is because the man needs rest. When a man’s spirit prays, the man is praying. When a man’s spirit knows something, the man knows something. Your spirit is the life that is in your body, and it will continue to live after your earthly body is decayed. Your spirit is you. And God’s Spirit is God. None of the activities of man’s spirit means that man’s spirit is a person, and yet Trinitarians use the same or similar activities of God’s Spirit as evidence that it is a person. We were created in God’s image, and the fact that the Bible mentions things done by the Spirit of God is only to be expected, since our spirits do and feel some of the same things that God’s Spirit does. It is altogether proper to speak of the Spirit as living, feeling, performing deeds, and knowing, because God does those things. And He does them by the same means we do them: by the Spirit that dwells in Him. God’s Spirit is His life, just as our spirit is our life (Jas. 2:26). On the following page is a chart showing some of the activities of spirits: God’s Spirit, man’s spirit, and evil spirits. 1. This is just a sampling of hundreds of verses that mention things spirits do and feel. 2. There are two words for “demon” in the New Testament, one masculine and one neuter, besides being called “evil spirits”. It seems that demons are considered to be personalities, though without bodies of their own. In doing the work of translating, some alterations are unavoidable. Translators must have the liberty to re-arrange, to alter, to add, or to omit a word here and there for clarity; to do so is a necessary evil when going from one language to another. What we saw in the Pneuma Tables, however, is something beyond that. There was nothing necessary about mistranslating the Greek words which the apostles used when referring to the Spirit of God. The most obvious reason for intentionally mistranslating those words is the personal faith of the translators. When asked why he so often translated “it” as “he”, Gary Zoella, who produced Translation #15, explained to me, “It is a grave mistake to use the neuter it or itself when referring to the Holy Spirit.” It was Mr. Zoella’s personal faith in the Trinity that caused him to think it is a “grave mistake” to refer to the Spirit as “it” or “which”. There is NO rule of Greek grammar that says it is a grave mistake to do so. But if it is a grave mistake to refer to the Spirit as “it”, then the New Testament writers made many grave mistakes! The conclusion that one must draw from the evidence is that intentional mistranslation of the apostles’ references to the Spirit has occurred in many modern translations for doctrinal, not grammatical reasons. This must have been done in order to make it appear that the holy Scriptures support the Trinitarian faith. What is especially disturbing about the translations used in the Pneuma Tables is that not one of them acknowledged what they had done. It is a matter of some gravity that none of these translators, in the Introductions to their translations, mention they intentionally mistranslated certain words that referred to the Spirit. As a matter of professional integrity, this alteration should have been acknowledged, regardless of what is true about the personhood of the Spirit. Considering the importance of the issue, this omission is inexcusable. God’s people around the world are buying Bibles, trusting that the translators have risen above personal opinion and have translated the original text faithfully. The evidence proves beyond any doubt that such is often not the case. Comment: Does this mean that these translators thought it was not possible to translate some of the apostles’ neuter words as neuter, when the Spirit was the subject? Comment: Overall, the ESV is a good translation, as are others on this list, but any impartial judge would conclude that they fell short of their stated goal, for they did not translate 13 of the apostles’ words literally (just in this small study) when it came to words related to the Spirit; the influence of their Trinitarian faith was too strong upon them to permit it.. Comment: This sounds impressive. But one must wonder, if these translators sincerely believed that the original Greek text was absolutely inspired of God and without any error at all, how could they have dared to alter so many Greek words related to the Spirit that they found in the original text? Of the thirty translations surveyed, the NKJV (1) was the most adamant that every original word of the New Testament was verbally inspired by God, without any error whatsoever, and (2) ranked among those most guilty of Trinitarian corruptions of the Greek text, at least 13. One must wonder, what justification could there possibly be for a translator to mistranslate the words of the original text when he himself has signed a confession of faith insisting that those words are pure and perfect, being the very words of God? New Testament writers often changed the gender of articles, adjectives, and pronouns that referred to a neuter word – if that neuter word referred to a person. Although there were many opportunities to do so, and although it was allowed by the rules of Greek grammar, New Testament writers never changed from neuter to masculine when referring to the Spirit of God. They always referred to the holy spirit as “it” or “which”, never “he” or “whom”. The Pneuma Tables provide proof of this. Many modern translations contain intentional mistranslations of certain words found in the Greek text because the translators sought to promote their Trinitarian faith.